I’m new to the forum but I’m counting on your help. I apologize in advance for my English, which is very weak. I have a problem, because my engine after renovation is still warming up. Exhaust gases get into the cooling system. The head is funcional. It was checked in two plants. I used a new composite gasket head and new head bolts. Tightened with a torque wrench according to the torque. The surface of the engine block and head were smoothed out. After putting on the head the problem still occurs. There are no other symptoms of damage to the gasket. I am asking for guidance what may be the reason and how to deal with it. Sounds like a possible cracked head. The head was checked twice in a reputable company. It is tight. No damage found. 1.) New head bolts. If head bolt threads or nut threads allow nut to bottom on the threads or bolt, then the nut force will not be transmitted fully onto the head. Possible causes: wrong bolt length for shaved block and head, wrong thread depth on bolt, wrong internal clearance inside acorn nut. This would lead to less torque effectively for holding the head down. 2.) Uncalibrated torque wrench reading high. 3.) Head gasket not sealing properly. There are variations on gaskets with choices of rings around various passage holes. 4.) 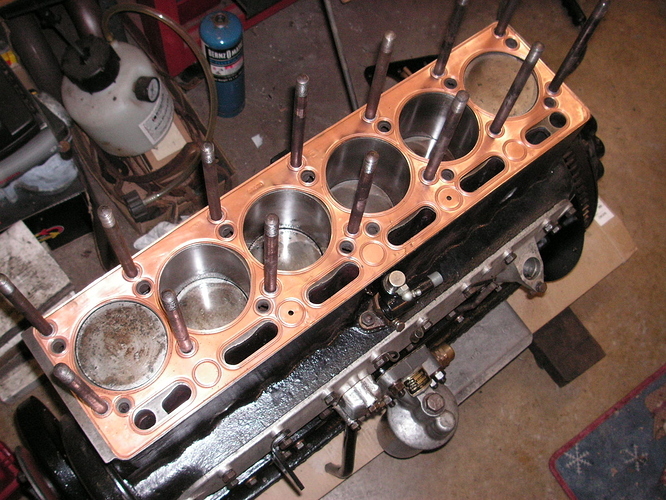 Block surface pulled up into head gasket during torque process. 5.) Head gasket not compressed enough. Did you run the engine to warm, cool down, pull the rockers, and retorque cold engine? Was the exhaust gas in the coolant seen by having coolant all the way up to radiator overflow tube when engine was warm and then seeing bubbles persist over time? Pawel, you said bolts, not nuts. Are they the correct BSF thread, not metric? My head gaskets have always been a single copper sheet, not composite. Surely we are talking about STUDS and not Bolts. Gases were not observed by the radiator cap. I performed a test for the presence of carbon dioxide. He went out positively. This time I ordered a head gasket with metal protection around all channels. I hope that it will seal better. How should I block surface pulled up into head gasket during torque process? With studs removed run a mill file flat across the stud holes, if it has pulled up it will show as shiny. As Roger M mentions above check that the dome head nuts aren’t bottoming out. Check also that the new head gasket fits around the bores correctly AND also compare it against the head. I have found some aftermarket head gaskets fit better facing up a certain way so check it in both directions. This is what I found were issues on my MK V that had the same problem.